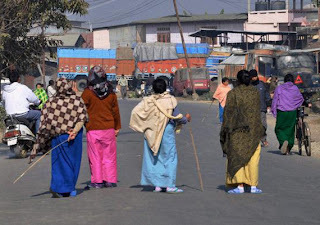 Imphal, Apr 8 : In the aftermath of the brutal murder of a woman N.Satyabhama Devi, 32, the Joint Action Committee has enforced an indefinite Manipur Bandh since Saturday. The JAC has demanded immediate arrest of the killer and has demanded punishment within five days. Large number of men and women came out on the streets from Moirangkhom near National Highway 2 to register their protests. They stopped vehicles from plying on the road and appealed to local shopkeepers to close down their shops. In Kakwa Bazar, from where Sathyabhama Devi hailed, hundreds of men and women along with representatives of civil body organizations held a rally which was followed by a march from Kakwa to Singjamei Chingamakhong. Slogans were raised against chief minister O. Ibobi Singh by the protesters. They tried to march towards Imphal, but were stopped by police late in the evening.